A message from our President, Sandra Colley, about the benefits of SITE membership! SITE is recognized in the insurance industry as a leading source of educational programs and seminars related to training and development. Our educational approach includes the annual conference, the popular Train the Trainer program, out ITP designation program and monthly webinar events, all of which provide excellent development and networking opportunities. Social media networking – Join us on LinkedIn, Facebook, and Twitter, all enabling you to network with members with a particular expertise, a common interest, or geographic location for the purpose of improving performance and building industry relationships. 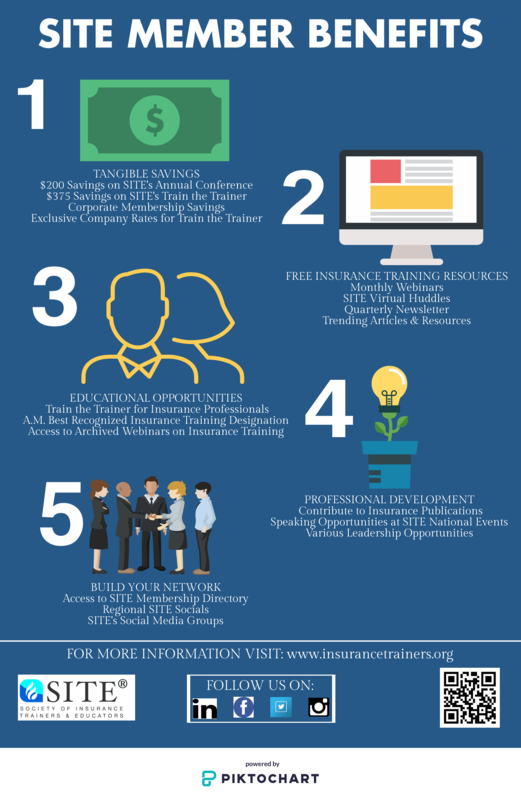 InSITE – SITE’s quarterly online newsletter is filled with information on training, insurance, and SITE activities. Insurance Training Professional (ITP) – This designation recognizes individual excellence and professionalism in training and education in the insurance industry. Train the Trainer – The only program of this kind specifically designed for insurance professionals. Train-the-Trainer provides practical applications of adult learning theory for designing and facilitating training. Annual Conference – Join us each year to hear, see, and participate in up-to-the-minute sessions provided by world-renowned professionals in training and development. SITE hosts a free educational webinar monthly. Become a member and get access to dozens of archived webinars on a wide variety of training and education topics. See the upcoming Events page for dates and topics. Become a SITE Member Now! For a print size version of the SITE Member Benefits please click on the image. "I would like to thank SITE for the leadership role they have taken in the insurance industry promoting continuing education. SITE’s dedication to promoting training and social opportunities helped shape my career as a trainer and manager and provided me positive role models to do both professions. Keep up the great work!"